Never miss a message again. And no more misplacing or forgetting your smartphone. plus flat rate p. + p.
Communicates via Bluetooth with your mobile phone. And requires neither battery nor charger. 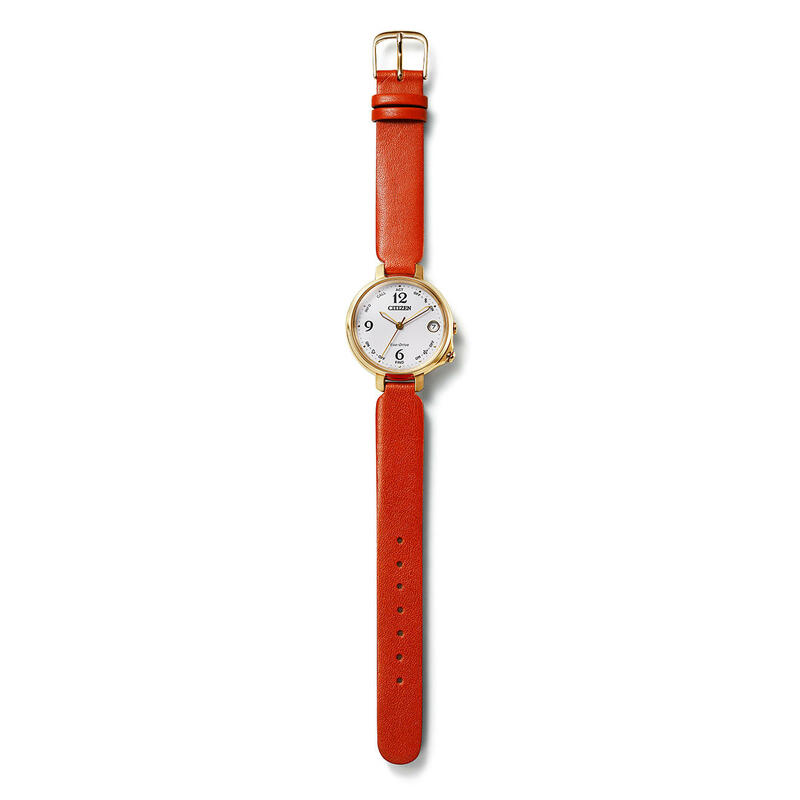 The analogue Citizen Smart Watch for women: Stylish accessory. Smart interior. Call display, smartphone search, solar-powered drive, ... – almost unbelievable everything this dainty watch can do. It disguises itself skilfully as an elegant piece of jewellery in the process. Just as harmonious with a casual leisure look as it is with a stylish business outfit. Citizen brought the first solar-powered Bluetooth watch to the market in 2012. Now in 2018 comes the smallest and flattest women’s model. Embedded in a gold-coloured, platinum-plated housing with white analogue clock face, the technology remains completely invisible. The jaunty, retro numbers and Losange pointer as well as the thin, cognac-coloured strap made from calfskin garner interest in the look. Just install the free app ‘‘CITIZEN Bluetooth Watch’’ on your smartphone* – and this and other functions (see box) are transferred via wireless Bluetooth 4.0 Low Energy connection. Up to 4 years dark power reserve. Japanese Citizen Clockwork Caliber W410, ±15 sec./mon. accurate timekeeping. Second hand. Date display. Mineral glass. Stainless steel housing, 33mm (1.3″) diameter, 10mm (0.4″) height. Waterproof to 5 bar (50m). 1. No battery, no charger: Even normal day and lamp light is enough to charge your watch. 2. As soon as a phone call, e-mail, or text message comes in on your smartphone, the second hand turns to the corresponding position and sounds an acoustic signal. 3. If you can’t locate your smartphone straight away, just take the crown out and your mobile device will send out a position-finding signal. With the activated ‘Anti-Lost’ function, you will be alerted from a distance of 10 metres. 4. The wake time is individually configurable for every day of the week. There are 3 types of alarms and 15 sounds to choose from. 5. The app on your smartphone transmits the local time of 316 cities worldwide. If you are travelling, you can touch the world map with your finger tip if you want to know the time where your business partner is located. 6. With the ‘light level’ indicator you can review the daily and monthly energy use – and see exactly how much you need. Monday – Saturday 8 a.m. – 10 p.m.
Sunday 9 a.m. – 10 p.m.
New ideas from around the world.